Highland Games were held long ago by the clans of Northern Scotland, but has it's origins far earlier with the Celts of Ireland in Roman times. Some credit the 11th century Scottish king, Malcolm Canmore, with initiating the first Highland Games. Contests in running, leaping, vaulting, wrestling, lifting heavy weights and putting stones (as one sees today) were begun more than a thousand years ago. Sporting contests called "wappinschaws" were held by the various clans. The clans' warriors needed to test their physical prowess in much the same way as modern soldiers engage in physical training. It was at one of these in 1574 that "tossing of ye barr" (caber-tossing) first appeared on record. * Scale weights used for measuring grain, oats etc. became the 56 lb and 28 lb weights throw for distance and height. * A rounded riverbed stone made the ideal stone of strength which every young boy had to throw a certain distance as a rite of passage into manhood. * In modern times a sheaf with a pitchfork has been added to some games and it emerged from agricultural purposes. In time the games made their way into local community fairs and by the 16th century the games became festive occasions. But in 1747 The Act of Proscription banned carrying arms, wearing the kilt, playing the bagpipes and public gatherings in Scotland . This essentially brought to an abrupt halt the old clan system in the Highlands. The Highland games ceased and were endanger of becoming extinct if something was not done to revive them. In 1781 the Scots Highland society offered to sponsor trophies and prize money for competitions in dancing, piping, and athletics during a popular fall fair. The next year the Act of Proscription was repealed. That year the St. Fillian’s society organized a full scale highland games and for the first time in decades the sword dance (previously considered a war dance) was included with the dancing, piping and athletic events. Scottish sports were spread all over the world by those in the Scottish Societies particularly by those people who emigrated between 1750 and 1850. The first Highland games in Canada took place in Antigonish, N.S. in 1863. 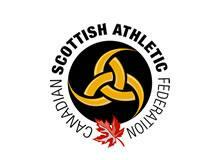 Today highland games exist around the world where these tremendous athletes compete in these time honored events. At the heart of any Scottish festival today is the Caber Toss, and these athletes combine the attributes of the athlete with the fellowship of the clansmen to make it an unforgettable experience. During the eleventh century, recreation centered around activities at the blacksmith shop. The 28 lb. and 56 weights were implements found there. The 28 lb. wt. was used to tie up a horse and the 56 lb. was used to keep a team of horses from wandering. These weights are metal with a chain and ring handle. The total weight is 28 lb. and 56 lb. with the overall length of each implement being 18 inches. The athlete has a 9' run up and must throw the weight with one hand. The object is to throw the weight horizontally for an optimal distance.